Melatonine CAS 73-31-4 is a manmade form of a hormone produced in the brain that exhibits antioxidant properties and has neuroprotective effects against Aβ peptides. Short-term treatment (up to three months) shows that Melatonine CAS NO 73-31-4 is effective and safe in improving sleep latency, sleep quality and daytime alertness. Melatonine 73-31-4, supplied by us, is safe formulation and highly effective. Customers are greatly satisfied with the high quality Melatonine. Storage: Store at +4°C for short term storage, or at -20°C for long term storage. Stable for at least 2 years after receipt when stored at -20°C. Melatonin 73-31-4 is a manmade form of a hormone produced in the brain that helps regulate your sleep and wake cycle. 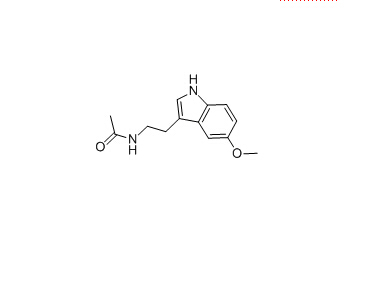 Looking for ideal Melatonine MFCD00005655 CAS 73-31-4 Manufacturer & supplier ? We have a wide selection at great prices to help you get creative. All the N-Acetyl-5-Methoxytryptamine 73-31-4 are quality guaranteed. We are China Origin Factory of Melatonin Receptors Coupled to a G-protein System. If you have any question, please feel free to contact us.